BELLATRIX (Gamma Orionis). If constellations could talk, they might well shout "unfair" at great Orion, the Hunter, one of only four constellations to have two first magnitude stars (the others Crux, the Southern Cross, Centaurus, the Centaur, and Canis Major, Orion's Hunting Dog). Moreover, it also has the fourth, seventh, and eighth-brightest SECOND magnitude stars. 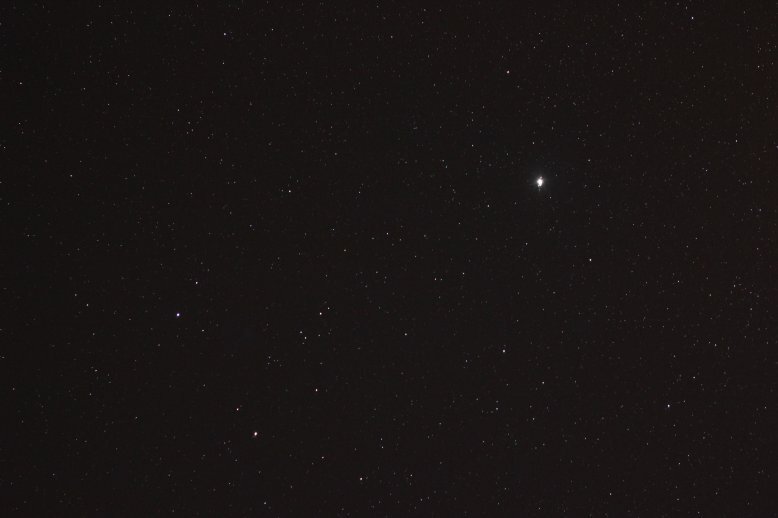 The brightest of these, Bellatrix, magnitude 1.64, follows immediately behind Castor (Alpha Geminorum), Gacrux (Gamma Crucis), and Shaula (Lambda Scorpii). (Numbers seven and eight within second magnitude are Alnilam and Alnitak, Epsilon and Zeta Orionis, the two brightest stars of the Belt.) As third brightest star in Orion, Bellatrix, at Orion's upper right corner, was appropriately assigned the Greek letter Gamma by Bayer. "Bellatrix," originally applied in medieval times to Capella and later transferred to Gamma Ori, translates from Latin as "the female warrior" (consistent with Orion as a giant warrior rather than as a hunter) and sometimes as the "Amazon Star." Blue-white luminous Bellatrix certainly lives up to its grand name. A class B (B2) "giant" (but see below), it is one of the hotter naked eye stars. With a temperature of 21,750 Kelvin it is in league with Spica, Adhara, and Shaula, as well as with the stars of the Belt. It seems not, however, to be physically a part of the Orion association of luminous O and B stars, as its distance of 252 light years (give or take 10) is only a quarter of the closest portion, the Orion Ia sub-association up and to the right of the Belt. Allowance for a large amount of ultraviolet light from the hot surface gives the star a luminosity of 7100 times that of the Sun. Combination with temperature yields a radius 5.96 times solar. The angular radius of Bellatrix, measured through interferometry, is only 0.00072 seconds of arc, which with distance gives a radius of 6.0 times solar, the beautiful agreement indicating that the various parameters are correct. The theory of stellar structure and evolution clearly shows the star to be a hydrogen-fusing dwarf and to "weigh in" at 9.0 solar masses. That Bellatrix is classified as a B2 giant is not an error. It just means that the star has the spectrum of a giant in the standard classification scheme. Such dichotomies are common among the B stars, wherein true dwarfs are sometimes classed as giants or subgiants. With an age of 20 million years, the star has about seven million to go before the core hydrogen runs out and it becomes a true subgiant, then, as it evolves, a giant. Bellatrix's iron abundance is around 70 percent that of the Sun, which is typical for local class B stars. It was taken as a magnitude standard against which astronomers could follow the meanderings of variable stars. But Bellatrix perversely seems to vary a bit too, by a few percent over an undetermined period. At 9 solar masses, Bellatrix is on the edge of supernova candidacy. If it does not explode as one, it will become a massive white dwarf near the 1.4 solar mass limit above which white dwarfs collapse. Mass flow from a close companion might put the eventual white dwarf over the limit, again making the star a supernova. But no neighbor is close enough. Gamma Ori B has maintained a constant separation of 178 seconds of arc over the past 170 years and is likely a true, though very distant, companion. From its brightness it's probably an M0 red dwarf with a mass of about half that of the Sun. At a minimum distance of 13,800 Astronomical Units, it would take at least 525,000 years to orbit, making it a fragile connection indeed. From the perspective of Bellatrix A, the companion would be about as bright as Jupiter in our sky. Not that it matters, as the star is far too short-lived to support any sort of life. Much closer, at 6, 10, and 12 seconds of arc, are three 20th magnitude stars, but there is no evidence that they are anything but line of sight coincidences. If they are ever seen to orbit, they would then be cool red dwarfs. Written byJim Kaler 1/21/00; revised 5/23/14. Return to STARS.